Titan Travel are holiday specialists offering a rage of vacations including; City breaks in both the UK and Europe, ship cruises and river cruises and coach tours. With Titan Travel you can visit the world, they offer holidays in North, South and Central America as well as Asia, Europe and the Caribbean. Titan Travel offer some fantastic deals which include monthly offers, late availability offers and even have a designated section where you can find holidays under £1000. In addition to this, they offer partner discounts with the likes of HoSeasons, Cottages4you and James Villa holidays. 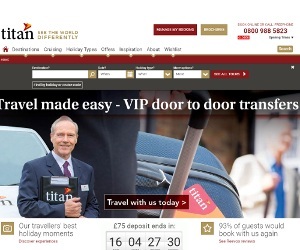 Titan Travel are well priced and they go all out to ensure a wonderful experience. We will keep you up to date on all the latest deals so keep an eye on our website for regular updates at VoucherSaver.co.uk.